SCIP will be closed over Easter Break. What is SCIP? - The SCIP program is a year-round fundraiser that directly reduces expenses for the families who participate in the program. If you have been at a parish that uses MANNA or SCRIP, these are different names for the same program. All these programs are designed to earn school families money toward their own tuition costs. The program us designed to earn school families money toward their own tuition costs. It also helps future families start saving towards tuition or graduated students for use in hign school or college. Religious Education families may save for their fees. Parishioners may choose to designate their savings to the School, Church, St. Vincent de Paul or a parish family of their choosing. Savings are taken off quarterly for St. Linus School, Religious Education, and Private High Schools. College families are issued checks two times per year. Saver families accumulate credit until they designate school of choice. Participation in SCIP is voluntary, and if you’d like to join you must do so at a SCIP table. Families need to open an account with SCIP to begin saving. Families must complete the SCIP application to set up an account. 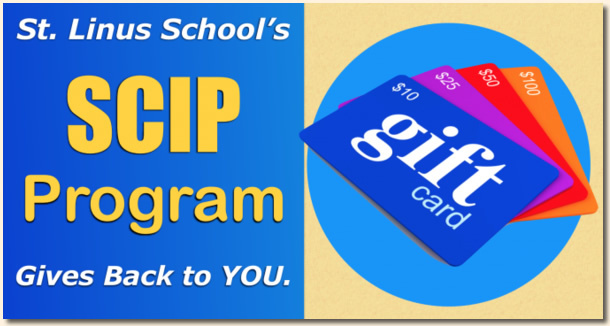 Once you’ve filled out the paperwork for SCIP and you’ve received your Family ID, you can begin to save money toward your tuition by purchasing gift cards from participating stores and businesses. Each gift card will offer a percentage back in credit. 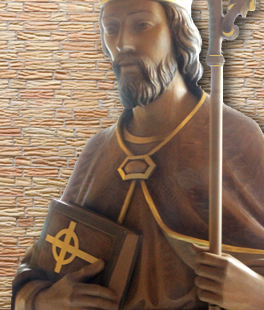 Your credits will be applied quarterly toward your St. Linus School family tuition. How SCIP Works - Gift certificates are purchased from stores and restaurants at a discount, and then they are re-sold to SCIP program participants at face value. SCIP splits the profit between a credit for the purchasing family and operating expenses for the program. Purchase Through School with Brown Envelope - The SCIP program is run by parent volunteers and purchases can be made through the brown envelope at school. To do this, you need to hand in your form by 9 am on Monday. In the event the school is closed on Monday, hand in your order form with payment by 9 am on Tuesday. All orders will be returned with the child you named on the form on Friday. Parishioners or Religious Education Families can drop off an envelope order on Monday Mornings before 9 am. The order will be fill and back at the Rectory by Friday morning. Purchase In-Person at our SCIP Office - SCIP offers two CASH and CARRY hours each week. We are available on Tuesday evening from 6-7 pm and Saturday from 9:30-11 am at the SCIP office. To get to the SCIP office, enter through Pre-K Door #6 on Linus Lane. Both cash or checks are accepted for our CASH and CARRY. For more information you can contact the SCIP office at (708) 425-1656 x 139 or email scip@stlinusschool.org or http://stlinusschool.org/scip/.